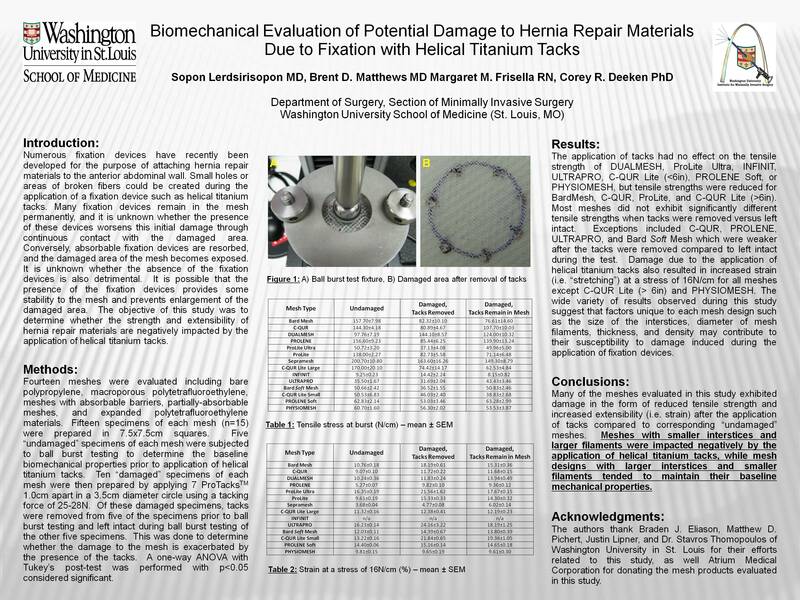 OBJECTIVES: The objective of this study was to determine whether the strength and extensibility of hernia repair materials are negatively impacted by potential damage during the application of helical titanium tacks utilized for laparoscopic ventral hernia repair (LVHR). METHODS: Twelve types of mesh were evaluated including six bare polypropylene meshes, five absorbable barrier meshes, and one expanded polytetrafluoroethylene mesh. Fifteen specimens of each mesh (n=15) were prepared in 7.5×7.5cm squares. Five “undamaged” specimens of each mesh were subjected to ball burst testing on an Instron® materials testing system to determine the baseline biomechanical properties of each material prior to application of helical titanium tacks. Ten “damaged” specimens of each mesh were then prepared by applying seven ProTack fixation devices spaced 1.0cm apart in a 3.5cm diameter circle using a tacking force of 25-28N. Of these damaged specimens, tacks were removed from five of the specimens prior to ball burst testing and left intact during ball burst testing of the other five specimens. This was done to determine whether the damage to the mesh is exacerbated by the presence of the tacks. A one-way ANOVA with Tukey’s post-test was performed with p<0.05 considered significant. RESULTS: Damage due to the application of helical titanium tacks reduced the tensile strength of BardMesh, C-QUR, ProLite, and C-QUR Lite (> 6inch size) regardless of whether the tacks were removed or left intact during the test. However, the application of tacks had no effect on the tensile strength of DUALMESH, ProLite Ultra, ULTRAPRO, C-QUR Lite (<6inch size), or PROLENE Soft. Most meshes did not exhibit significantly different tensile strengths when tacks were removed versus left intact, indicating that the contact of the tacks with the mesh does not accelerate the damage caused by puncture of the mesh during tacking. Exceptions included C-QUR, PROLENE, ULTRAPRO, and BardSoft Mesh which were weaker after the tacks were removed compared to leaving the tacks intact during the test, indicating a potential shortcoming if absorbable fixation devices were utilized with these materials rather than permanent metallic fixation. Damage due to the application of helical titanium tacks also resulted in increased strain (i.e. greater change in length or “stretching” of the mesh) at a stress of 16N/cm for all meshes except C-QUR Lite (> 6inch size), which remained comparable to its baseline strain value regardless of tacking. CONCLUSIONS: The use of helical titanium tacks causes damage to mesh materials utilized for LVHR, which could potentially lead to holes or tears in the mesh and even hernia recurrence. Many of the meshes evaluated in this study exhibited damage in the form of reduced tensile strength and increased extensibility after the application of tacks compared to corresponding “undamaged” meshes. However, some meshes were not as susceptible to damage and retained their baseline biomechanical properties even after the application of tacks. Some meshes also demonstrated a greater reduction in tensile strength after removal of the tacking devices, suggesting that absorbable fixation devices may not be ideal for all meshes compared to permanent metallic fixation.